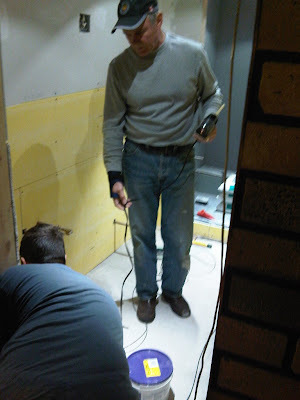 Last weekend my dad came over to help Ryan install the heated flooring. There was a little bit of math involved in laying the flooring and seeing as my dad is a walking calculator we knew it would take less time if he helped out! Plus it gave my mom and I time to do the radiator box. Now the lesson that Ryan learned while gluing the heated flooring down is LISTEN TO YOU WIFE! I told him he would have to completely wash the concrete floor and get ALL of the dust and dirt up first or the glue wouldn't stick. Ryan told me he didn't have to wash the floor that he had swept it 3 times and vacuumed and that would be enough... so I bit my tongue and waited to say 'I told you so.' Well about an hour in my dad and Ryan came upstairs saying there were off to get more glue sticks because.. wait for it... THE GLUE WASN'T STICKING! YEP I called it!!! I believe I received a 'Ya ya you were right' from Ryan when I said I TOLD YOU SO with a big grin on my face! But after a lot of glue this is what the laid heated flooring looked like! We only bought a small amount because you can't cut or cross the wires when laying it so we didn't want to have too much. This should work just fine. Can you tell they made a blob around where the toilet will go, no point in having heating under the toilet but you definitely want it close so your feet stay hot hot hot! 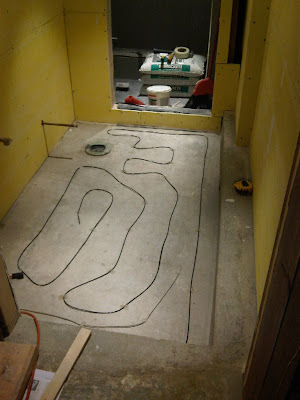 Then on Sunday Ryan and Dave got the self leveling cement and poured it over top of the heated flooring in a thin layer. This week Ryan's brother Calvin is over helping out with the tiling. So yesterday he laid the dry pack in the base of the shower and tiled the floor in the bathroom!!! It was SO exciting to come home from work to find this! And a little bit later I went downstairs to find this loveliness of a floor!!! Doesn't it look amazing!!!! Three cheers for Calvin and his super amazing tiling work! And of course my hubby for helping out too with the tiles. The plan today, if everything goes well was to tile the walls. I'm hoping everything went well and when I go home I will have some pretty tiled walls!!! OH its all coming together so nicely!!! I love the colour of the tiles! Since the bathroom has no windows we wanted to keep it light and airy!